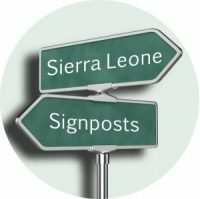 As a consultant with the government, the major thrust of my work has focused on essentially building (or rebuilding) the foundations of Sierra Leone’s public institutions, and setting the basis for designing appropriate policies. Addressing the challenges of public policy and the arrangements for its formulation are important, but constitute only a part of the many ingredients that make a solid foundation for a modern economy of a country, that should occupy a respectable place in the community of nations in the 21st century. Another critical ingredient is social capital. Here I am referring to that factor that encourages cooperation and facilitates mutual support for the benefit of the whole, in a society. Like public institutions and policy, this should also be erected on a solid foundation. Everyone in the society contributes to social capital; and its nature, size and value are all influenced by the social contract with the state, existing in that society. Our social contract gives us civil rights and obligations; and when we realize that there are shortcomings in this contract we use elections for selecting representatives that would help us renegotiate its terms. Shortcomings in our social contract manifest themselves as the dilution of such rights, or when the state fails to give us the minimum we expect – law and order, equal opportunities, basic social services, the possibilities to expand and enjoy the products of our hard work. Less than a decade ago this country was embroiled in civil war. That was the most obvious evidence of the breakdown of the social contract and the paucity of our social capital. In short the state and the economy had not been built on a foundation that is rock-solid, and it was almost washed away. We are now in the process of rebuilding the foundation for a new society. BUT, are we searching for the foundation that is rock solid this time around? Or have we found it?